Ok, I put together some thoughts on a group of MLP's (Master Limited Partnerships) at the request of a number of subscribers. There are 50 or so U.S. MLP's out there in various parts of the energy business but I limited myself to the upstream (E&P) variety as pipelines and midstream (processing) operations are not my normal ballywick. I'm very comfortable dissecting E&Ps and I took a list of 10 and weeded that down to six I might see investing in for the long term. Still the names are beaten down and yields appear high. One thing I think many investors do when the sector is beaten down is pick the names with the highest yields. I like to say sometimes things are "cheap for a reason." Take QELP, which is not in following tables despite having the highest current yield at 30%. They've got lawsuits, they got financial irregularities, a complex structure to begin with and a CEO who quit when people started asking questions. But that's the highest yield I could find. Other metrics are helpful. The industry employs a few metrics in addtion to the ones normally looked at by E&P investors. Total Debt / Adjusted EBITDA. You want this one to be low as its essentially a measure of debt in relation to your annual cash flow. Adjusted EBITDA / Cash Interest Expense. This one you want to be high as its basically a coverage ratio for your ability to make your interest payments. Everyone in the group below can easily make their interest payments but there are some MLP's in the non-upstream names which come closer to having interest coverage problems. Yield...This Is Not Your Father's Rate of Return. With the stocks pounded down by 1/3 to 1/2 from their peak cycle highs yields are still high. But the next ratio is most important in determining whether or not that distribution (like a dividend but different for tax purposes), and therefore their yield remains in place. Distribution Coverage Ratio. This is the ratio of distributable cash flow vs the company's actual distribution. The higher the ratio the more room the company has if things turn temporarily lower to keep the distribution up. LOE. 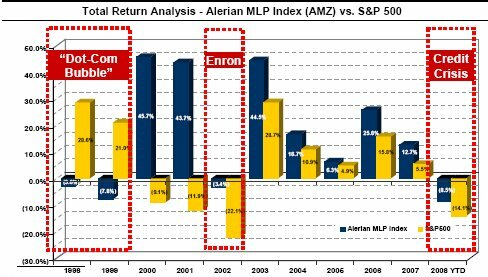 Ok, lease operating expense is standard for E&Ps and I think of high importance when looking at upstream MLP's. The lower the better. Reserve Life: Also standard for the E&P, this is a measure of reserves to production (measured in years). The higher this is, the lower your decline rate. Most upstream MLP's focus on cash cow type properties so a reserve life of 20 is not uncommon. Shorter reserve life properties would mean the firm would need not only maintenance capital but acquisition capital shortly just to remain in business. All of the firms in the tables below have long reserve lives. If I had to pick favorites, I'd go with size. Probably (LINE) first, which operates a majority of its properties and has a strong management team which impressed at IPAA despite the downtrodden environment, then (ATN) who is largely Marcellus focused and then (EVEP). Even after the modest recovery of the last few days these names are yielding 17%, 13%, 17% respectively with some of the better distribution coverage ratios in the business ahd better than average operating expesenes, especially (ATN). This entry was posted on Monday, October 20th, 2008 at 9:54 pm	and is filed under Uncategorized. You can follow any responses to this entry through the RSS 2.0 feed. You can leave a response, or trackback from your own site. z – you and Cramer are thinking along the same lines (scary). Apparently, he recommended LINE last night. Stock up 11% pre-market. Thanks zman. I nippled on line and evep last week and was looking at bbep because of their strong managment team as well as them being 80%+ hedged for the next 2 years at $8+MCF. I will now turn my attention to ATN which frankly I looked at briefly and moved on. Because of the way MLPs are taxed, it is best NOT to hold these companies in an IRA or other tax deferred retirement vehicle. If the yearly distribution is over $1,000 then taxes will have to be paid from within the IRA.